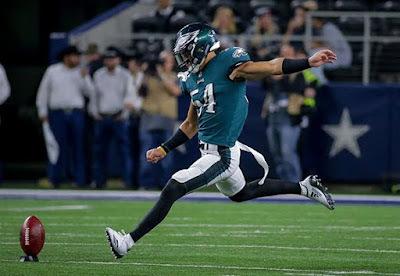 On Sunday Philadelphia Eagles placekicker Jake Elliot suffered a concussion in the second quarter of a rivalry game against the Dallas Cowboys. For many NFL teams, this injury would have been tantamount to defeat. The kicker is not only responsible for putting points on the scoreboard via point after touchdown attempts and field goals, but he (or she!) also helps to establish field position as the opposing team's offense begins their drives. In carrying out these duties, kickers rarely get injured. As a result, teams don’t typically dress a backup on game day. When your only kicker does go down with an injury, though, a team is forced to attempt to convert on more fourth downs and go for two-point conversions after every touchdown. Perhaps worse still, they risk surrendering great field position to the opponent on offense. Fortunately for the Eagles, an unlikely hero stepped up. Backup linebacker Kamu Grugier-Hill saved the day on Sunday. Grugier-Hill boomed several kickoffs into the end zone, including one that resulted in a touchback. Although he didn't attempt any field goals, his on-field production wasn't too shabby for a guy who had never kicked a football in a game before at any level -- let alone in the pros. How does someone who has never been a placekicker perform at such a high level? Simple. He played soccer growing up. Owing to his background as a two-sport athlete, he was more than up for the challenge. By playing soccer in addition to football, Grugier-Hill developed a wide “movement vocabulary” during his formative years. So wide that it allowed him to switch seamlessly to a highly specialized position and excel at it many years later. Sadly, over the coming decade we’ll likely see a lot fewer athletes versatile enough to do what Grugier-Hill did this past weekend. This is because many of today’s young athletes are opting to specialize in one sport beginning at a very early age. Granted, the Grugier-Hill example is a bit contrived. Before this weekend, Grugier-Hill had never had to kick a football in a game, and with any luck he’ll never have to again. But there’s no doubt soccer has helped him succeed in countless other ways on the gridiron throughout his career. There are plenty of other examples of professional athletes playing two sports throughout their youth, too. In the basketball world alone, Steve Nash grew up playing soccer. So did rising star Joel Embiid. Allen Iverson played football. So did LeBron James. These are some of the best and craftiest players ever to step foot on the court. Coincidence? I think not. By concentrating on one sport year-round, we’re screwing our young athletes up. We’re robbing them of the chance to develop a more diverse set of movement skills. We’re subjecting them to the same stressors over and over for 50-plus weeks out of the year, which likely contributes to injury. We’re making them worse. So take a page out of Grugier-Hill's playbook, and avoid specializing in one sport until the tail end of high school, or even wait till college. It might not result in the opportunity to fill in as the placekicker for the Philadelphia Eagles, but it will certainly put you in a better position to get the chance.